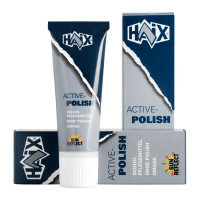 Product information "HAIX Fire Flash 2.0"
The new FIRE FLASH 2.0 by HAIX now meets the requirements of fire fighters on duty in an even more effective way. This is a high and robust boot made of high quality hydrophobised bull leather which is able to resist extreme heat. A GORE-TEX® inner lining ensures that it remains both waterproof and highly breathable, thus delivering the very best degree of climate comfort. The contoured signal yellow shapes on the toe cap provide wearers with better visibility. The toe cap itself is made of steel and thus delivers ultimate safety. The toe cap area of the boot features a profile to give additional protection against wear and tear. The Fire Flash 2.0 also has yellow reflective strips to the sides of the heel and on the uppers. The Fire Flash 2.0 boasts a rubber shell sole with a rugged street and terrain tread that offers a high degree of slip resistance. The sole is also particularly heat resistant and will provide reliable protection if you are called to deal with a fire. It is even able to withstand temperatures in excess of 200 degrees. The sole is insulated by an internal layer of PU foam. This provides a cushioning effect to decrease the strain on your joints. The Fire Flash 2.0 is manufactured in robust bull leather of particularly high quality. Despite being up to 2.7 millimetres thick, the leather used is both water repellent and highly breathable. Sun Reflect stops the boot from heating up unnecessarily because of its dark colour. The signal yellow highlights on the HAIX High Durability Cap offer enhanced safety when on duty. The boot’s toe cap has a special profile to help prevent wear and tear. A zipped leather inlay covers up the fire-resistant laces to ensure that they cannot become snagged on rubble or any other objects. The HAIX Lacing System and special pull-on straps make it easier to put on and take off the boot quickly. Simply lace your boots to the required tightness the first time you wear them. They can then be put on and removed just by using the zip. 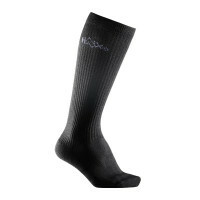 The GORE-TEX® inner lining will keep your feet dry and provide protection against liquids. The HAIX Climate System uses the natural pumping motion generated as you walk along to transport moisture to ventilation slits at the shaft and tongue ready to be expelled. The insole is replaceable and can also be washed if necessary. The boot’s steel toe cap gives total protection against falling objects. The sole of the Fire Flash 2.0 features a street and terrain tread. This provides a secure grip on any surface and a high level of slip resistance. Special rung profiling gives additional safety if you need to climb ladders. The sole of the boot is completely resistant to liquids such as oil and petrol. It is also puncture resistant to help shield against penetration by any sharp objects that may be underfoot, such as stone splinters, shards of glass and nails. Super heat-resistant PU foam is used to provide the sole with outstanding insulation properties against high temperatures. The foam also offers a cushioning effect that will reduce the strain on your joints. The FIRE FLASH 2.0 fulfils all the demands of a top quality and professional fire brigade boot. High end materials and superb workmanship combine to produce a boot with a long product life that will offer you the protection you need in every work situation. 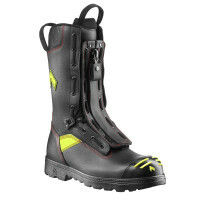 Order your HAIX fire fighter boots now!